Of course I had to play along -- here's the card I created. I was inspired by colors to do a Fall themed card and immediately thought of our Pick-a-Pumpkin stamp set. I stamped the thanks pumpkin with orange ink (closest I had t the papaya) and then the argyle pumpkin in eggplant. I cut them both out using the coordinating Pick-a-Pumpkin Die Set. I had a hard time working the forest into my card but used it on the pumpkin stems and a lighter version of it for inking the circle behind the pumpkins! For the card I used a strip of paper that has a "gauze" layer over it - I thought this looked good for the Fall/Halloween theme. Then I added a strip of orange pattern paper, some enamel dots and a twine bow. Adorable card, and love the purple paper with the gauze on it!! Beautiful colours for a challenge and beautiful card!!! Super cute card! I LOVE the purple paper with gauze on it, how cool is that!? You have all these awesome craft stuff, Jen! Your punmpkins are beautiful, especially the purple argyle! 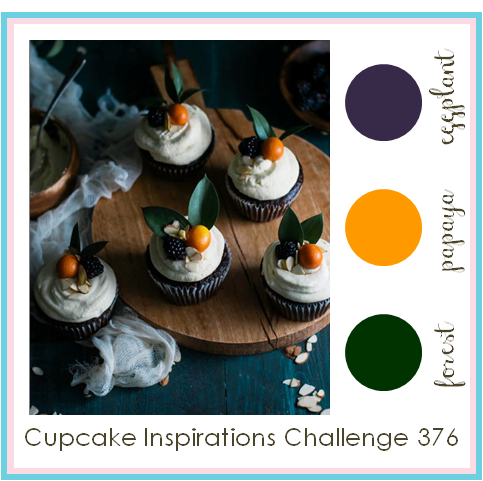 Thank you ao much for sponsoring the Cupcake Inspirations Challenge this week! I'm thrilled that you've joined us for this challenge, not only in sharing a spectacular card, but for being such a generous sponsor! Thank you! You've showcased the colours wonderfully...I'm swooning over your pumpkins! Apologies for being MIA with comments: that 'thing called life' is keeping me on my toes! Aiming to leave a note more often; but I hope you know I don't miss a single post...one of my favourite feeds on my Feedly list! Jennifer love this cool card! That argyle pumpkin looks so great on there.